Japan is facing the super-aging of society and it is estimated that by 2025, more than 35 million people (about 30% of the population) will be over 65 years old. 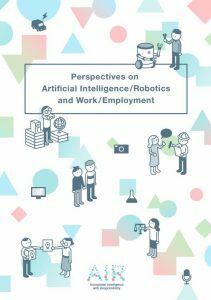 Under such circumstances, it is often said that the Japanese are more optimistic about introducing artificial intelligence (AI) and robots to the workplace, in contrast with other countries, who are more concerned about the possibility of machines taking over jobs currently performed by human beings. However, the workplace in Japan will not immediately be taken over by machines. Technology and society are mutually related, so we must closely examine how each research area is interacting with ethical, legal, and social issues. In addition, experts in domains such as healthcare and agriculture are also carefully reorganizing their tasks through the use of AI and robots and negotiating numerous variables in the process, such as institutions, organizational cultures, economic efficiency, and human values. These practices can be seen all over the world, not only in Japan; however, there is not as much information on Japan’s practices in this regard due to the language barrier. We hope that this report will contribute to an understanding of Japanese technological, institutional, cultural, and social aspects on AI and robotics. The original report on this topic was published in Japanese as part of the Research Materials series of the “Science and Technology Research Project” of the Research and Legislative Reference Bureau (RLRB), the National Diet Library. The RLRB is responsible for providing the Diet with legislative research and information services and is an associate member of the European Parliamentary Technology Assessment (EPTA), an international network of parliamentary science and technology policy institutions. In the “Science and Technology Research Project,” the RLRB cooperates with outside experts to conduct research on topics related to key national policy issues pertaining to science and technology. The results of the research are published and distributed to Diet members and other relevant parties, as well as to the general public online. The “Science and Technology Research Project” aims to provide assistance for legislation, therefore, the information should be provided in ways that are as objective and nonpartisan as possible, and without supporting any particular policy. Or you can download from this site.